has been involved with illustration for over 25 years, having spent time as an Art Director, an editor and biographer, and as an illustrator himself. He has authored/compiled over twenty titles on Golden Age Illustration, the best illustrators of the period, and Late Victorian painting. You can see how all of this has influenced his illustration here. Adjunct professor teaching History of Animation and Illustration. 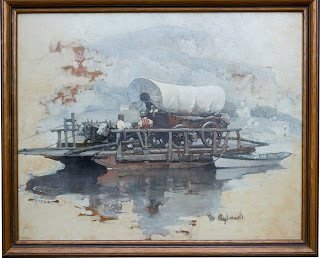 The painting, as I found it on ebay. OK, here's a story that's a bit different. It's about rescue and restoration, and a whole different aspect of illustration appreciation. It's also something that will become more and more important in years to come, as so much illustration art was not regarded as worth saving in its day. Much of it was done on and with inferior materials, and a great deal of it was considered little more than the means to achieve an end (the printed product), not seen for the value it had in and of itself. Saving this art today preserves illustration history, and can make for good investment. About two years ago, I had provided an entry on William James Aylward, 1875-1956. In my eyes, he is one of the most overlooked gems of the Brandywine alumni. We have a lot in common; and I may be biased due to a few of those similarities—I collect his work with some serious intent, there may be only one other artist I seek out with more enthusiasm. So when I got notice that something new from Aylward had posted on ebay late last March, I expected more printed pages from Scribner's Magazine, or an illustrated copy of Jack London's The Sea Wolf. I got a pleasant surprise. The listing was for a 16'X20" painting, signed by Aylward, and it is without a doubt, his. 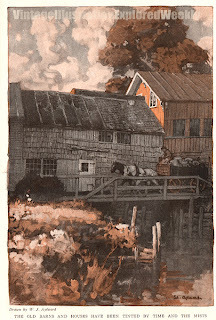 OK, I have a nice pencil piece by him, and recently acquired an ink sketch as well, but I hadn't thought I might be able to find a painting, at least on ebay. And it was reasonable. It was pretty dirty, definitely had seen better days, but I wondered if the sellers really knew what they had. It had a "buy it now" price, and I took it right away. They probably did know what they had, and more precisely, they knew what needed to be done. But that's what allowed me to have a chance at this piece in the first place. 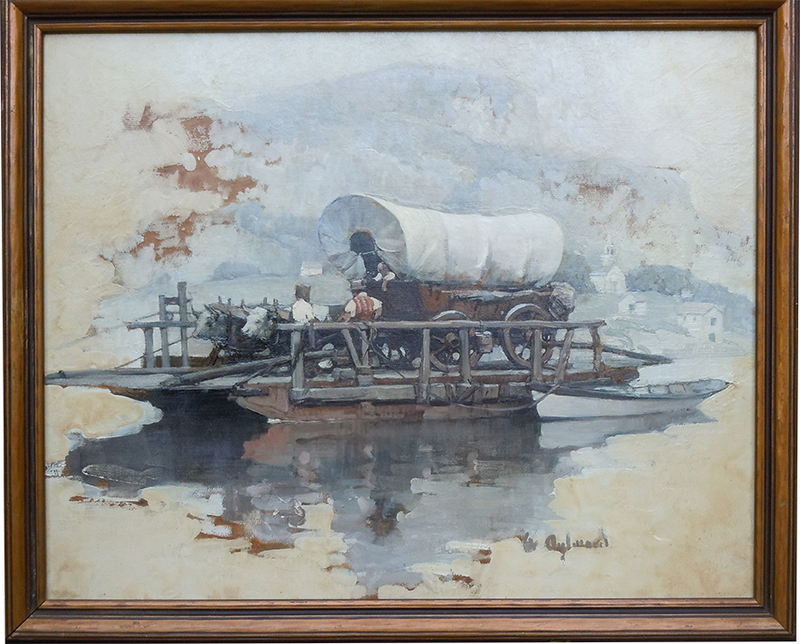 A few pieces by Aylward done in a similar fashion. 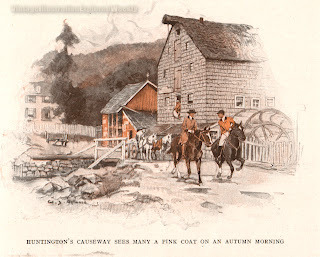 The two-tone work he did for Scribner's or Harper's were often small vignettes, black and orange. These are from 1918. Today, I live in Huntington Township, not far from where this scene was painted. The sellers asked me if I was sure (odd for ebay), and cautioned me that the piece needed some restoration. I carefully looked over the images provided, and was still good with it at the price they offered. So it came. I wanted to have it cleaned up—or at least looked at—to see if I had saved something, or just let go of a small wad of cash. I called The Society of Illustrators—to ask who they used to clean up works for them. I knew this wouldn't be cheap, but If I was going to have someone look at it, I wanted it to be someone who understood this type of work, and maybe even was familiar with Aylward. They recommended Pratzon Art Restoration in Manhattan, and it could not have been a better fit. Not only was Jill Pratzon familiar with Aylward, she specializes in illustration of this sort, and had worked on some Aylward before. 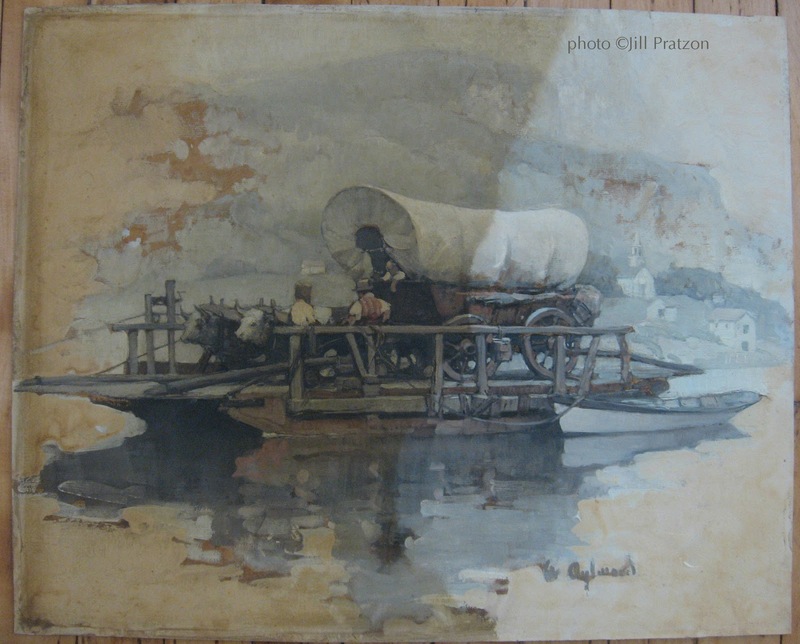 While the restoration was more than the painting was, the two prices together cost me about as much as I might have paid if I had found this piece in the shape it's in now, in an auction catalog. So, I went ahead, already being somewhat invested in time and money. She did a fantastic job, and now I have a sweet original painting by one of Howard Pyle's students. Restoration—in process—photo by Jill Pratzon.